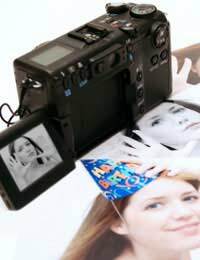 It is often said that digital photography has reduced the perceived importance of physical prints; people are often happy simply to have copies of their images on their computer rather than possessing hard copy. However there is still something fantastic about holding your prized photograph in your hands, printed on good paper and appearing just as you visualised it. If you are interested in making your own digital prints, you should first have some idea about the variety of printing methods available. The most common of these is the inkjet printer. These have a relatively low initial cost, and work by firing tiny dots of ink onto the paper. The upsides of inkjets include the low cost of the equipment, as well as the ability to produce good quality prints as long as the printer is calibrated correctly for the paper. However, these positive aspects are mitigated by the fact that ink is expensive, and that the printing process can be slow. For a faster print, laser printers are also available. These use toner rather than ink, and transfer it to the paper with an electric charge. Good laser printers are more expensive than inkjets, although they can produce better quality prints and do not suffer from the possibility of colour bleeding in the same way that inkjets do. Inkjet and laser are the two most common types of printer, but newer alternatives are slowly making their way onto the market. Dye sublimation printers have been more readily available over the past year or so; these are similar to laser printers, but use heat rather than a charge. However, the consumer models currently available are only capable of producing small prints. Alternatively, printers using either thermal wax or microdry techniques are also available; these are similar to dye sublimation models but use coloured wax instead of ink, and therefore do not need special paper. These are well out of most consumers’ price range, however. Aside from understanding the process of your printer of choice (which is ultimately likely to depend on budget), it is also worth saying a few words about resolution. If you are using Photoshop (or, indeed, most other image editing products) you will notice that you are given a number of different options with regard to the resolution of your image. Many people become confused as to the difference between dots per inch (dpi) and pixels per inch (ppi). The distinction between the two is important when printing your images. Ppi is an expression of the resolution of your image; it literally describes the number of pixels that are contained in each inch of the picture, and is therefore a gauge of image quality. Dpi, on the other hand, describes the number of dots of ink that will be transferred to the paper per inch of the image. Dpi, therefore, is an expression of the print resolution. Consumer inkjet printers generally work at a print resolution of around 300 dpi, although they could go as high as 2400. In order to ascertain the required image resolution to print your picture at the suggested print resolution, you need to multiply the print resolution by the print size. Thus, a 6” x 4” image printed at 300 dpi would require an image resolution of 7200 pixels.